Sclerotherapy involves injecting a solution of either salt water (hypertonic saline 20% NaCl) or a chemical solution (e.g. sodium tetradecyl sulphate or polidocanol) directly into the varicose or spider vein that causes them to collapse permanently. Sclerotherapy uses injections from a very fine, thin needle to improve the cosmetic appearance of spider veins, treat small varicose veins in the legs, and relieve related symptoms such as aching, burning, swelling and cramping. 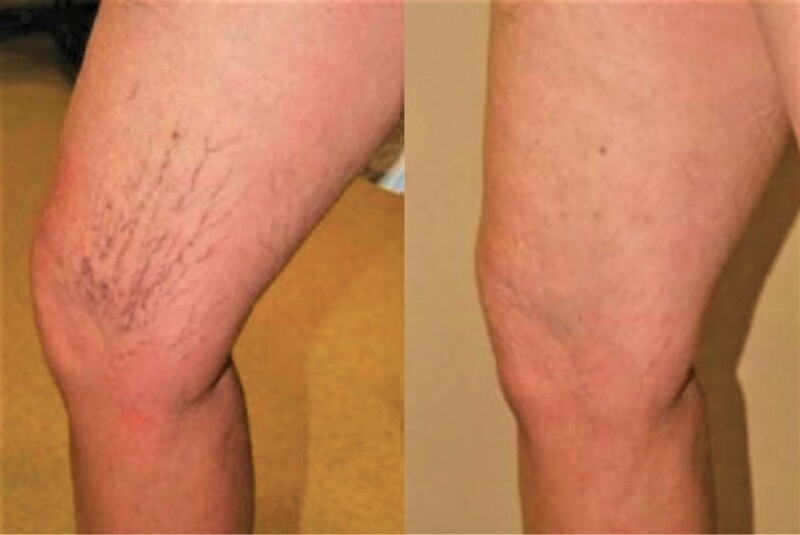 The sclerotherapy solution causes the vein walls to swell, stick together and seal shut, stopping the flow of blood, forcing blood to reroute through healthier veins. The collapsed vein is reabsorbed into local tissue and eventually fades within a few weeks. Larger varicose veins may also be treated by sclerotherapy. This is the best method for varicose veins if they are tortuous or recurrent (endovenous laser treatment may be preferred for stright veins or on the first occasion). First a Duplex ultrasound scan should be performed to map out the path of superficial, perforator and deep veins. Those greater than 5mm in width and demonstrating reflux are the most suitable for treatment. Sclerotherapy of larger superficial veins and perforator vessels is usually performed with ultrasound (echo) guidance. Best results are achieved using a foam sclerosant, where the sclerosant solution is mixed with air in a ratio of 1: 4 to form minute bubbles. This provides a greater volume to push the blood away so the sclerosant may adhere more effectively to the blood vessel wall. Most often sclerotherapy is used to treat leg veins, but sclerotherapy may also be used for venous malformation, or blue vessels on the sides of the nose and elsewhere. No anaesthetic is required. A strong solution (the sclerosant) is injected directly into the blood vessel causing inflammation of the walls of the vessel. The vessel disappears over a few weeks to months. Sclerotherapy is the most common treatment for improving the appearance of varicose and spider veins on the legs. Sclerotherapy is often considered the treatment of choice for small varicose veins. Each treatment session typically results in elimination of 50 to 80 percent of the injected veins. Repeated treatments may be necessary at six- to twelve-weekly intervals to achieve up to 85% success at three years. Although each session may involve a large number of injections, the needle used is very fine so that pain is not generally a problem. There may be some stinging as the solution travels through the smaller vessels. These become red and slightly swollen, sometimes itchy for a few hours. The number of veins treated in one session varies, and depends on the size and location of the veins. The procedure is usually completed within 30 to 45 minutes. Varicose veins are caused by weak or damaged valves in the veins. The heart pumps oxygen-rich blood to the body through the arteries. Veins then carry the blood from the body back to the heart. As your leg muscles squeeze, they push blood back to the heart from your lower body against the flow of gravity. Veins have valves that act as one-way flaps to prevent blood from flowing backwards as it moves up your legs. If the valves become weak, blood can leak back into the veins and collect there, causing veins to enlarge and become varicose. Spider veins can develop from weak or damaged valves as well. They can also be caused by hormone changes, exposure to sun and injuries. If you are considering sclerotherapy, you will meet with a dermatologic surgeon for a consultation to discuss your cosmetic goals and to determine if sclerothereapy is the best approach to meet your needs. Your surgeon will examine the veins you would like treated, and will also examine you for evidence of more serious venous problems. Photographs may be taken for before and after results. You will also discuss your medical history, including previous surgeries, present and past health problems, medications, and nutritional and herbal supplements you are taking or have taken at some time. If you decide to have sclerotherapy, your doctor will give you specific instructions to follow before surgery. Your doctor will also review any medications you regularly take and tell you if you need to stop taking them before treatment. Your doctor may recommend that you wear compression stockings after sclerotherapy to help with healing and decrease swelling. You will be told where you can buy them before your procedure. If you’re pregnant or breast-feeding, doctors recommend waiting to have sclerotherapy done. Superficial thrombophlebitis, which is a blood clot that forms in a vein just below the skin. Symptoms include skin redness; a firm, tender, warm vein; and sometimes pain and swelling. Deep vein thrombosis (DVT), which is a blood clot in a deeper vein. It can cause a “pulling” feeling in the calf, pain, warmth, redness, and swelling. However, sometimes it causes no significant symptoms. If the blood clot travels to the lungs, it can be fatal. Yes, sclerotherapy is a simple and typically safe procedure. In most cases, the pain, discomfort and swelling associated with the veins disappears within days, and the vessels slowly resolve over several months. Larger injected varicose veins may become lumpy and/or hard for several months before resolving. Raised red areas may appear at the injection sites and should disappear within a few days. Brown lines or spots on the skin may be seen at the injection sites. In most cases, they disappear within three to six months, but can be permanent about five percent of the time. Bruising may occur around the injection site and can last several days or weeks. You will feel small needle sticks and possibly a mild burning sensation. And you may experience a cramping sensation for one to two minutes when larger varicose veins are injected. You should discuss your individualized treatment plan with your provider. Serious complications following sclerotherapy are rare. However, as with any procedure, it does carry some risk and may cause side effects. Allergy from the sclerosant (this does not occur with hypertonic saline). Ulceration. This will eventually heal leaving a small scar, or may be removed surgically. 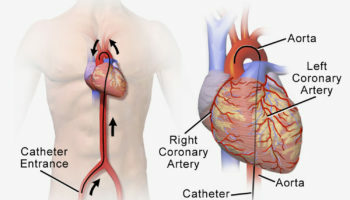 If an artery is inadvertently treated, the surrounding tissue may die (necrose), which is potentially serious. Deep venous thrombosis. The risk is very small when venules are treated but it occasionally follows sclerotherapy of larger varicose veins. It is more likely in those predisposed to blood clotting through inherited thrombophilia, lack of exercise, air travel, after major operations and other reasons. Deep venous thrombosis may rarely lead to potentially serious pulmonary emboli (clots in the blood vessels of the lungs) in about 1 in every ten thousand procedures. Staining or brown pigmentation, at the site or along the line of the vein. This occurs in about 30% of patients. In most cases this resolves but it may take many months. Capillary matting (multiple tiny red blood vessels). This is an increase in the number of fine red vessels around the injection site: it may disappear on its own, or can be treated by further injections or a vascular laser. Very fine vessels may be too small to inject, in which case a vascular laser or intensed pulsed light treatment may be worth trying. These are similar to hives, and should disappear within a day or so. Darkened areas may result when blood escapes from treated veins. They are probably formed from iron in the blood. These dark areas occur more often in patients who have larger veins or patients who tan easily. In most cases they disappear within a year, but they may last longer. About one-third of patients develop groups of vessels, especially on the thighs. Most disappear by themselves, some need additional injection treatments or laser therapy, and a few vessels may not disappear with treatment. These occur when some of the solution escapes into the surrounding skin or enters a small artery at the treatment site. They can be successfully treated, but it is important to tell your dermatologist immediately if they develop. Bruises usually occur after laser treatments and are probably related to the thinness of blood vessel walls. They usually disappear in a few weeks. Occasionally, bruising occurs after sclerotherapy. Although allergic reactions are uncommon, they can be treated. Inform your dermatologist immediately if you do experience an allergic reaction. This is very unusual but can be treated with medications such as aspirin, compression, antibiotics or heat. Lumps are caused by coagulated blood. They are not dangerous and may be drained by your dermatologist a few weeks after injection. Inflammation. This is usually mild but may cause swelling, warmth and discomfort around the injection site. Your doctor may suggest aspirin to reduce the inflammation. Blood clot. A lump of clotted blood may form in a treated vein that may require drainage. Rarely, a blood clot may travel to a deeper vein in your leg (deep vein thrombosis). Deep vein thrombosis (DVT) carries a risk of pulmonary embolism (a very rare complication of sclerotherapy), an emergency situation where the clot travels from your leg to your lungs and blocks a vital artery. Seek immediate medical care if you experience difficulty breathing, chest pain or dizziness, or you cough up blood. Air bubbles. Tiny air bubbles may rise in your bloodstream. These don’t always cause symptoms, but if they do, symptoms include visual disturbances, headache, fainting and nausea. These symptoms generally go away, but call your doctor if you experience problems with limb movement or sensation after the procedure. Allergic reaction. 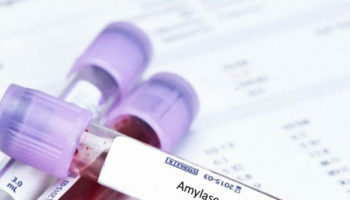 It’s possible that you may have an allergic reaction to the solution used for treatment, but this is uncommon. Before the sclerotherapy procedure, your doctor performs a physical exam and gathers your medical history. Tell your doctor if there’s a possibility you are pregnant and discuss any recent illnesses, medical conditions, allergies and medications you’re taking, including herbal supplements and aspirin. You may be advised to stop taking aspirin, nonsteroidal anti-inflammatory drugs (NSAIDs), iron supplements, or blood thinners several days prior to your procedure. Do not apply lotion to your legs before or after sclerotherapy. Leave jewelry at home and wear loose, comfortable clothing. Since you may be asked to wear a gown, you may want to bring a pair of shorts to wear during the procedure. Depending on which veins are involved, your doctor may request ultrasound imaging on the veins in your legs. Ultrasound is a painless procedure that uses sound waves to produce images of structures inside the body. Sclerotherapy procedure is often done on an outpatient basis. However, some patients may require admission following the procedure. Please consult with your physician as to whether or not you will be admitted. Sclerotherapy does not require anesthesia and is typically performed in your dermatologic surgeon’s office. The procedure takes about 15 to 30 minutes, but the exact length of time depends on the size of the area and the number of veins being treated. Depending on its size, a single vein may have to be injected more than once. 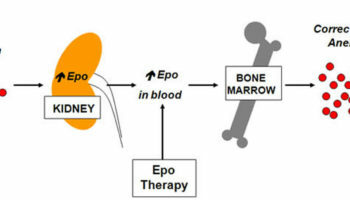 Treatment must be performed weeks or months apart. Multiple veins may be injected during one treatment session. During the procedure, you’ll lie on your back with your legs slightly elevated. Your doctor will cleanse the area to be treated before inserting a sclerosing solution into the targeted vein with a fine needle. The solution displaces the blood and reacts with the vascular endothelium causing the vein walls to swell, stick together and scarring the vein, stopping the flow of blood. As a result, the vein fades within a few weeks. A variety of products are used, including hyperosmotic solutions (e.g., hypertonic saline), detergent solutions (e.g., sodium tetradecyl sulfate), and corrosive agents (e.g., glycerin). Injections typically work better on small (1 to 3 mm) and medium (3 to 5 mm) veins; however, a precise diameter used to make treatment decisions is lacking. Although sclerotherapy is a clinically effective and cost-effective treatment for smaller varicose veins, concerns about the development of deep venous thrombosis and visual disturbances, and the recurrence of varicosities have been noted 1). You may experience some minor stinging or cramps when the needle is inserted into the vein. Be sure to tell your doctor if you have any discomfort. Some people experience minor stinging or cramps when the needle is inserted into the vein. If you have a lot of pain, tell your doctor. Pain may occur if the solution leaks from the vein into surrounding tissue. After the injections, your doctor will apply compression and massage the treated area to keep blood out of the injected vein and disperse the solution. A compression pad may be taped onto the injection site to keep the area compressed while your doctor moves on to the next vein. Often cotton wool pads under adhesive plasters are applied to the injection sites. Pressure is applied to the treated vessels using Grade 2 graduated compression hosiery (support stockings) and/or bandages. These are usually worn for between seven days and three weeks following each treatment. They come in different sizes and colors. After the procedure, it is important to walk around to prevent formation of blood clots in your legs. Most people return to their normal activities on the same day, but it may be wise to have someone drive you home after the procedure. Your doctor will probably advise you to avoid strenuous exercise for two weeks after the procedure. Avoid sun exposure to the treated areas for two weeks after the procedure. The inflammation caused by the injections combined with sun exposure can lead to dark spots on your skin, especially if you already have a dark skin tone. Wear compression stockings to maintain compression on the treated veins. Veins that respond to treatment generally don’t come back, but new veins may appear. 1. ↵ Campbell B. Varicose veins and their management. BMJ. 2006;333(7562):287–292.